We have a ton of fresh basil in the garden, so I wanted to make use of that. I decided to do this chicken sauté dish with a delicious, fresh garden salsa. I was also inspired by a recent issue of my favorite cooking mag that featured various grain dishes. I had barley in the fridge, so I made this great, lemon and bay leaf-scented pilaf as a side (I’m very keen on things flavored with lemon and bay leaf!). The main and side went so well together — I hope you’ll give them a try! Preheat oven to 375 degrees F. In a bowl, toss corn with 1 Tbsp olive oil and spread mixture evenly on a foil-lined cookie sheet. Roast for about 18 minutes, stirring occasionally, until corn begins to brown. Transfer to a bowl. Stir in tomatoes, green onions, basil, 2 Tbsp olive oil, salt and pepper. Cover and set aside. Sprinkle chicken with salt and pepper, then dust with the flour (shaking off excess). Heat butter and oil in a large skillet over medium-high heat. Add chicken and sauté about 5 minutes per side, until done. 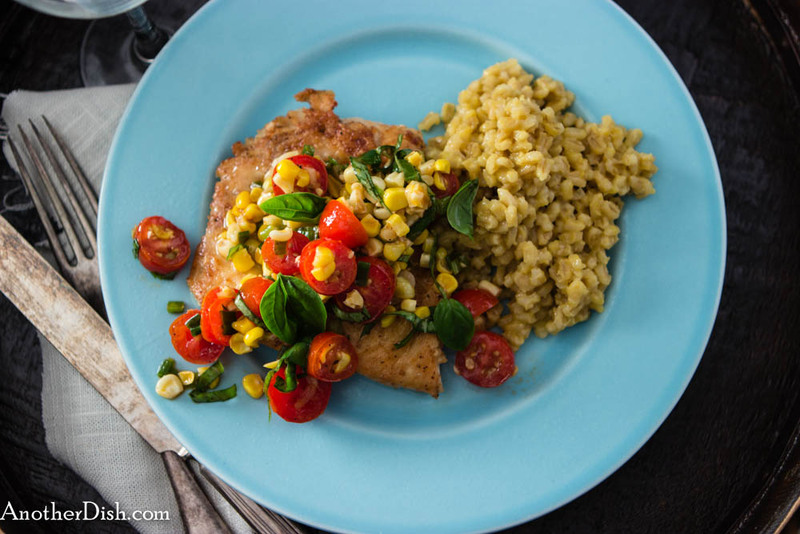 Serve chicken topped with tomato-corn salsa. Heat butter in a medium sauce pan over medium heat. Add onions and sauté for about 5 minutes, until onion softens. Add Barley. Stirring constantly, cook 3 minutes. Add the stock, salt and bay leaf. Stir and bring to a boil. Reduce heat to low, cover and simmer 45 minutes. Remove from heat. Stir in lemon peel, cover and let stand 10 minutes. This entry was posted in Chicken, Main Dishes, Pastas and Grains and tagged Barley, Cooking, Corn, Food, Food Photography, Foodie, Recipes on July 28, 2014 by AnotherDish.